CoolGear's new USB C hub provides 4 USB 3.1 Gen1 ports to include 3 USB-A ports and 1 USB C port. 1 Downstream and 1 Upstream port use the reversible USB C connector. 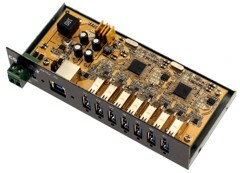 USB C hub for industrial applications is compact and mountable with 4 ports comprising of (3) USB-A downstream ports, (1) USB C downstream port, and (1) USB C upstream port to your computer. The CG-4PU31C2P USB C hub is a Gen1 hub using USB 3.1 to support Super-Speed 5Gbps data transmission speeds and takes advantage of the reversible type-C port in both directions. This hub is self powered with a 2-pin terminal block connector to supply power input of +7 ~ 48V DC sold separately. Provides 4 (1 USB-C and 3 USB-A) downstream facing USB 3.1 ports. Uses included USB 3.1 A to C cable for upstream data.